One child dies every five minutes as a result of fake anti-malarial medicine, said Michaelle Jean, general secretary of the International Organisation of la Francophonie (Organisation Internationale de la francophonie – OIF) at the start of an International Conference (in French) on access to quality medicines and other medical products in francophone Africa on the margin of the World Health Assembly, on 22 May. The conference was organised in collaboration with UNAIDS, and supported by the World Health Organization. A Declaration [pdf] containing actions items to fight fake medical products is currently being signed by countries. Last week, African ministers of health, who were meeting as a Working Group of the Specialised Technical Committee on Health, Population and Drug Control adopted a treaty for the establishment of the African Medicines Agency (AMA), according to an African Union press release. The AMA was praised at the OIF conference, which was meant to bring to the international attention the issue of falsified and sub-standard medicines, everywhere in the world, but in particular in francophone Africa, and what is needed to curb the rampant criminal trade. Michel Sidibé, executive director of UNAIDS, opening the conference, said Africa is bearing 25 percent of the global weight of disease, but only produces about 3 percent of the medicines it needs. He called for a criminalisation of fake medicines manufacturers and distributors. Benin President Patrice Talon insisted on the fact that the primary victims of fake medicines are the poorest in the population. If nothing is done about fake medicines, he said, undefeated illnesses and microbes will not fail to become rampant everywhere in the world, including in developed countries. The scourge of fake medicines continues to wreak havoc, and is only increasing, he said. the 2009 Cotonou Declaration [pdf] (Benin) against the traffic of falsified medicines, did not lead to a decrease of the traffic of fake medicines, as criminal organisations swiftly reorganised themselves he said, underlining the fact that the high prices of medicines is encouraging fake medicines consumption. 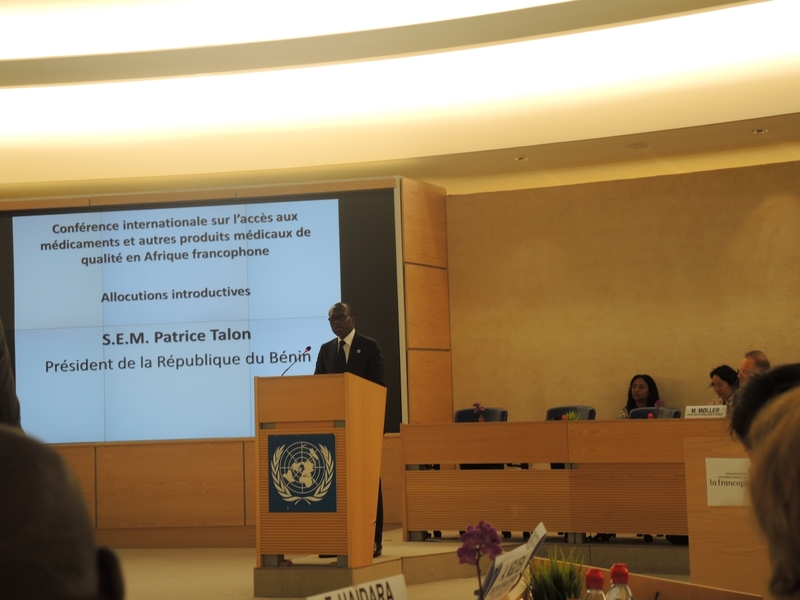 For the last two years, he said, Benin has committed to eradicate illicit fake medicines distribution channels, President Talon explained, adding that although the fight is far from over, the country has won significant victories. Benin’s determination is irreversible, he said but the country on its own cannot win the fight against fake medicines, he said, calling for an international effort combining information, training, investment and sincerity. He said the pharmaceutical industry has to stop developing production chains for the exclusive use of poor countries. Such discrimination is immoral, he said, and weakens the fight against fake medicines. Is it possible that in the same country some medicines are manufactured for the poor, which are not recommended for the rich, he said. Some 70 to 80 percent of fake medicines are not manufactured in hidden corners, or in basements, he said. They are produced in known units, and in developed countries. They are not produced in small countries, in poor countries, he added. Developed countries have yet no real determination to fight fake medicines, he said. Note: Read the full article in our sister publication, Health Policy Watch, www.healthpolicy-watch.org. "Africa Takes Steps For Access To Medicines: Conference To Fight Fakes, Develop Local Production" by Intellectual Property Watch is licensed under a Creative Commons Attribution-NonCommercial-ShareAlike 4.0 International License.